It’s been a while since I’ve posted here and I owe Forklife readers an explanation and an apology… I’ve been blogging elsewhere! 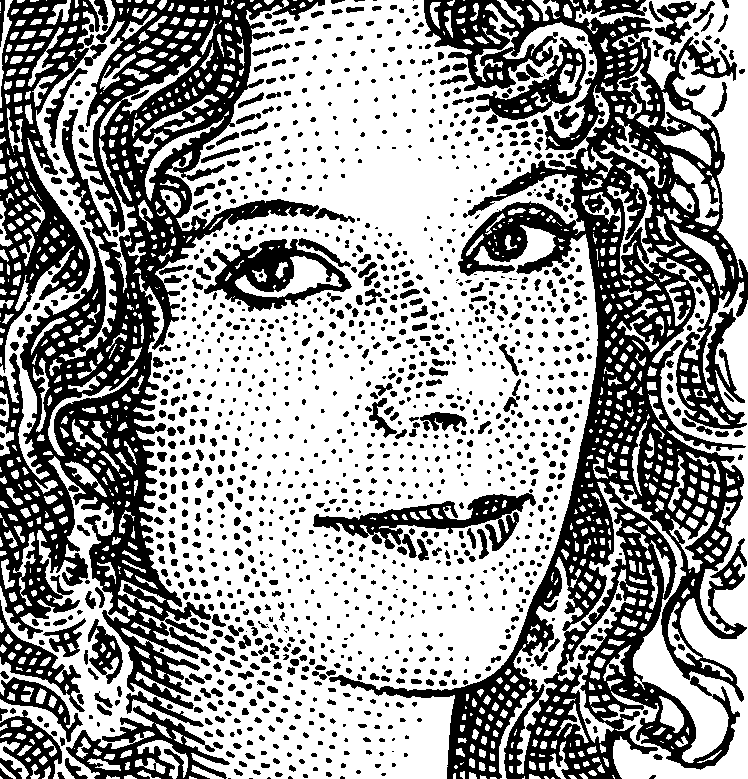 Specifically at The Wall Street Journal, where I’m one of the two wine columnists, along with Jay McInerney. And although the Journal blog “On Wine” is New York rather than North Fork-centric, I hope you’ll check it out and send me your thoughts. I’ve already found some terrific North Fork wines to write about there. I’m not leaving Forklife- I promise I will be back from time to time- and in the meantime, please visit me at http://blogs.wsj.com/wine/. My Wall Street Journal column debuts tomorrow, April 17th. It’s a holiday weekend and as my neighbor Joan said to me, “All the people are out.” I wasn’t sure if Joan meant everyone was outdoors enjoying the spring weather, everyone from Up the Island had come out to the North Fork for the day or, finally, if she meant from a census-taking perspective. Joan is officially employed by our federal government as a census taker and no one could possibly appreciate her job more than Joan- though I suspect part of it is the voyeuristic possibilities inherent in census-taking. “I get to see all the great houses,” Joan says. Their vineyards, planted mostly to Merlot and a little bit of Sauvignon Blanc and Cabernet Franc are not far from my house. The vines are fanatically well-tended- actually everything about Croteaux Vineyards is fanatically well-tended as well as stylish- the house, the vineyard, the Croteaus themselves. This isn’t surprising given that Paula was once in the fashion business and Michael is a first-rate designer. If they weren’t individually and collectively so nice I’d have a decidedly large inferiority complex about just being their neighbor. (Michael designs all their wine labels – above- admittedly not a great shot by me). Three of us went over to taste the new wines- including my friend Louisa Hargrave, who driven from her house a few miles away. “We just bottled some of these wines two days ago!” Paula said (In pride or exhaustion or as a disclaimer?) We tasted the first three ‘basic’ rosés, each made from a different Merlot clone, as well as the “sauvage” wine made from wild yeasts and finally, a rosé of Cabernet Franc that was more red than rosé. 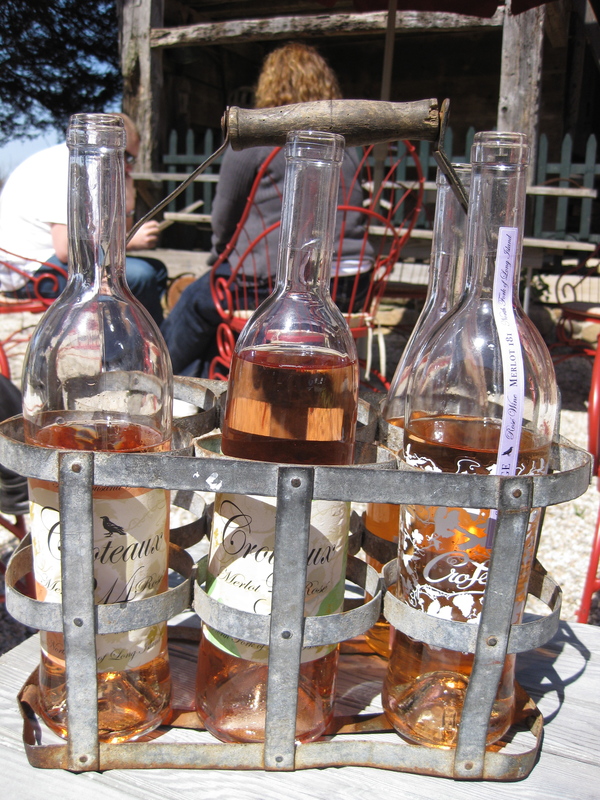 “Rosé for red wine lovers,” Paula said. I loved the Merlot 314 (the clonal number) which was bright and charming with a wonderful texture- more substantial than the lighter Merlot 181 and more accessible right now than the Merlot 3, which is a barrel-aged version of rosé. Although it’s only the second day they’ve been open (unlike most wineries on the North Fork, Croteaux Vineyards is closed during the winter), the cars were streaming into the driveway. “We’ve had people calling up all week asking us if we’ll be opening this weekend,” Paula said. I bought a bottle of the 314 and told Paula I’d be back at the end of the week for more and maybe the Sauvage as well. “If we aren’t sold out by then,” she replied. “I love telling people I’m an oyster farmer,” Eric said to me. “They have no idea what I’m talking about.” To be honest, I didn’t (really) either til I visited the Peconic Pearls oyster farm. Hidden away in Southold (sort of, since it’s located on Oysterpond Road), the Peconic Pearl farm looks like a cross between a munitions factory and an abandoned boat dock. 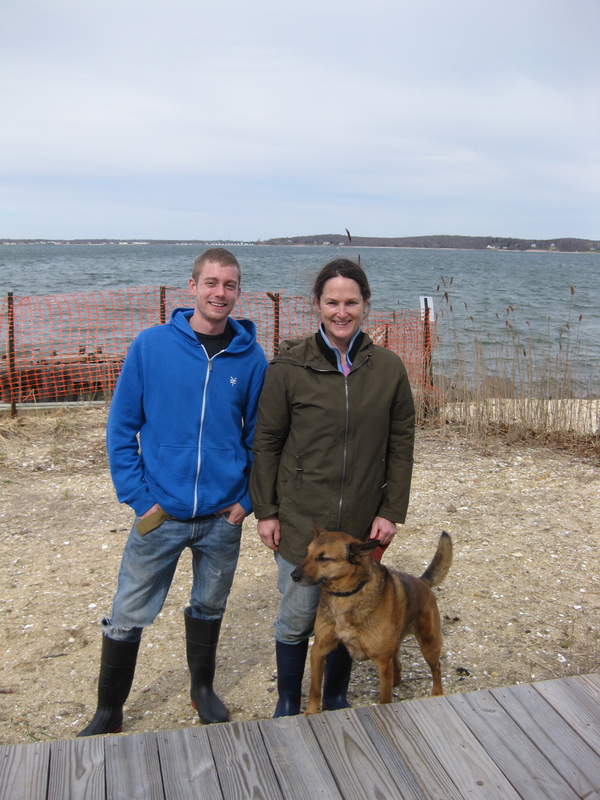 But it’s where Karen Rivara (and Eric Mullwe, at left) are farming oysters, the aptly-monikered Peconic Pearls. The munitions factory aka the “bunker” is where millions of tiny oyster seeds that look more like bits of sand than bivalves to me, are spawned into bar snacks. “I start with about 60 million eggs,” Karen said to me, “But I usually end up with only four million actual oysters.” At fifty cents apiece or so that didn’t sound so terrible to me. On the other hand, after a tour of the facilities- from the bunker (a half-underground building) to the greenhouse where Karen cultivates algae to the boat shed where oysters are also spawned- it sure looked like a lot of hard work. You can find Karen’s Peconic Pearls (she also sells Mystic Oysters, harvested in Mystic, Connecticut) in all the best restaurants and bars in New York, including of course, the Grand Central Oyster Bar. And by ordering Karen’s oysters you can not only eat well but do good, since anywhere from five to twenty cents of the price goes back to the Peconic Land Trust. It’s been such beautifully warm weather this week, I’m half-expecting leaves to suddenly show up on branches and flowers to spring from the ground. The fact is, there isn’t much to see on the North Fork in these very-early-days of spring- save for some daffodils in pots and a few feeble pansies. But I’ve been looking for it everywhere … especially since I got my bike back from the shop. (I finally had it repaired when the winter accumulation of grit and sand had grown so great that I could barely move my pedals or even change gears). I’ve been riding my bike all around-searching and searching for some nascent sign of spring. Just yesterday, I found something that I think qualifies: this metal dog in a field. 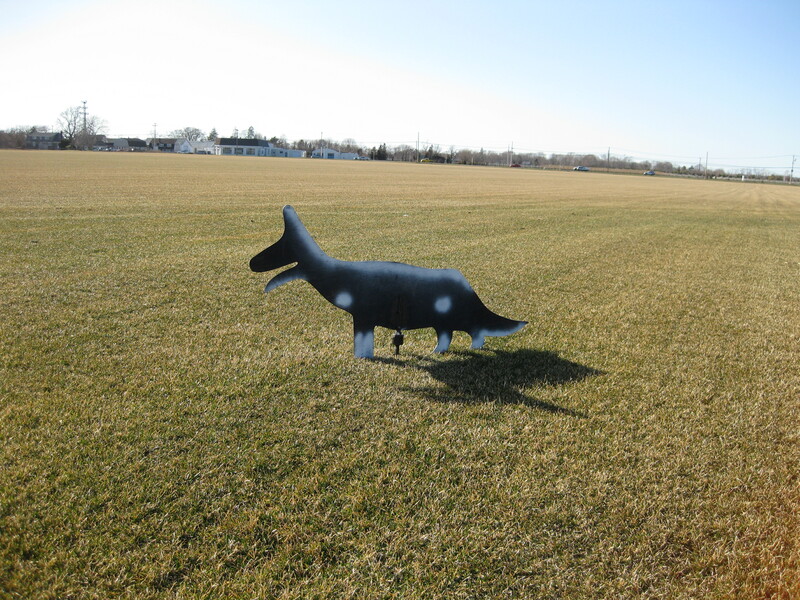 Actually I found a pack of three, all standing watch over a large patch of sod. Some might argue a metal dog in a field isn’t exactly a springlike harbinger, but I’d argue it it- if only because it wasn’t there in the winter months. But what exactly were those metal dogs doing there? I called to ask my friend and neighbor Paula, who grew up on the North Fork and is a true farmer’s daughter. Paula knew exactly what metal dogs I meant and said she thought they were put there to scare off Canada geese. Canada geese can make a real mess of sod. “The dogs spin in the wind and scare the geese away,” she explained. But this dog and his friends never moved, I replied. I think they might have gotten stuck in the ground. “That’s too bad,” Paula said in a tone that clearly conveyed she was through with the topic. But I can’t stop thinking about those three metal dogs. Perhaps tomorrow I’ll ride back to free them. The winds of spring are blowing, after all. The weathermen are calling this past weekend’s storm The Hurricane With No Name (perhaps they ran out of monikers when it was snowing?) But with near-70-mile an hour winds sweeping over and across the North Fork and throughout New York, it sure felt like a hurricane to me, nameless or not. It started Saturday afternoon and lasted well into Sunday morning. The damage was considerable – though mostly away from the Fork. 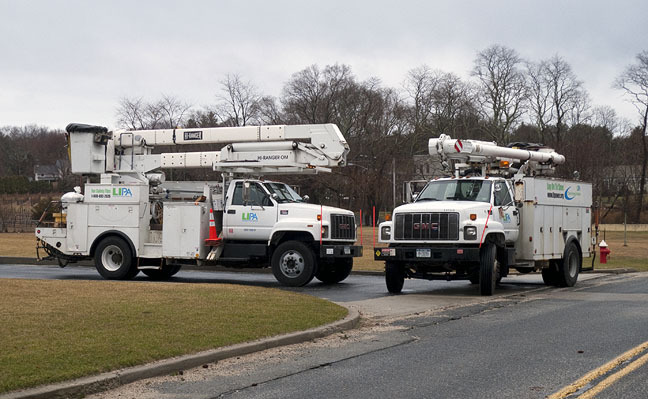 For example, I have a friend in Connecticut who was powerless for more than 24 hours and was told not to leave her house in New Canaan on account of all the downed power lines and another friend in Stamford who thinks he may not have power until possibly Wednesday. I was sheltered for a time by my friends Jane and David, who took a break from bailing water out of their basement (they live near a creek) to take in Rudy the dog and me. Several hours later, just as we were about to give up and drive to New York, two men in a white truck from LIPA (Long Island Power Authority) showed up. It was midday on Sunday and by two o’clock they’d restored life to my street – aka water, heat and lights. I was so grateful, I gave them a couple bottles of wine, including (fittingly) a North Fork Merlot. My friends all say “This never happens anymore” (the part of about losing power that is) but all the same, I’ll have plenty of water on hand for the future- and plenty of wine too, of course. 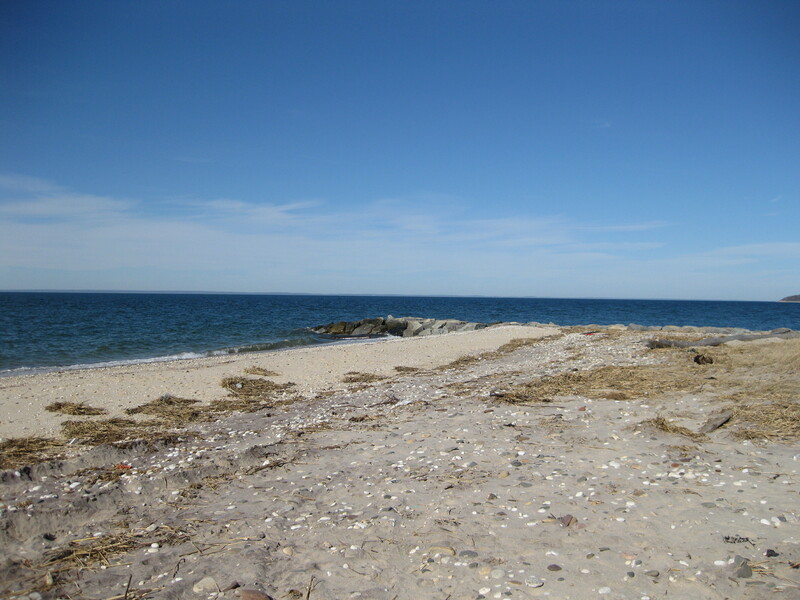 I showed this picture to my sister the other night (she was in town from Texas for her work) and she immediately declared, “The family is visiting you this summer.” I took the picture of a beach about three miles from my house – it’s the Long Island Sound though it looks like the sea. Perhaps it’s because she lives in landlocked Texas that it looked particularly ocean-like to my sister (and nothing like her hometown of Dallas) but looking at it reminded me -yet again – why I love the North Fork so much. I was reminded of the North Fork in another way at another place in town (Manhattan) that very same night. I was at Cafe Boulud- the ‘casual’ outpost of Chef Daniel Boulud on East 76th Street, where I was doing a bit of research for my next FOOD & WINE column. Though it’s called a ‘cafe’ the place is actually quite posh and the crowd is very well shod, save for the couple sitting next to me, both wearing sneakers. The food is superb and inventive and the wine list is equally stellar (if a bit pricey) and there were a couple of North Fork wineries represented, at prices their owners probably can only dream of obtaining back at home on the Fork. I wondered how many of the restaurant’s well-coiffed and well-heeled diners would actually consider ordering a $90 Long Island Cabernet – especially given the table of three, one man and two women, near me who ordered “a glass of Chardonnay” … that the two women would share. One of the surest signs of spring in wine country: The Pruning Season Starts. Vineyards all over the Fork are getting a pre-season trim to ensure the vines are in balance once the grape growing season begins. My neighbors at Croteaux Vineyards were pruning yesterday when I rode by on my bike. I had a chat and a walk around the vineyard with Michael Croteau and took a few shots of his crew (above). 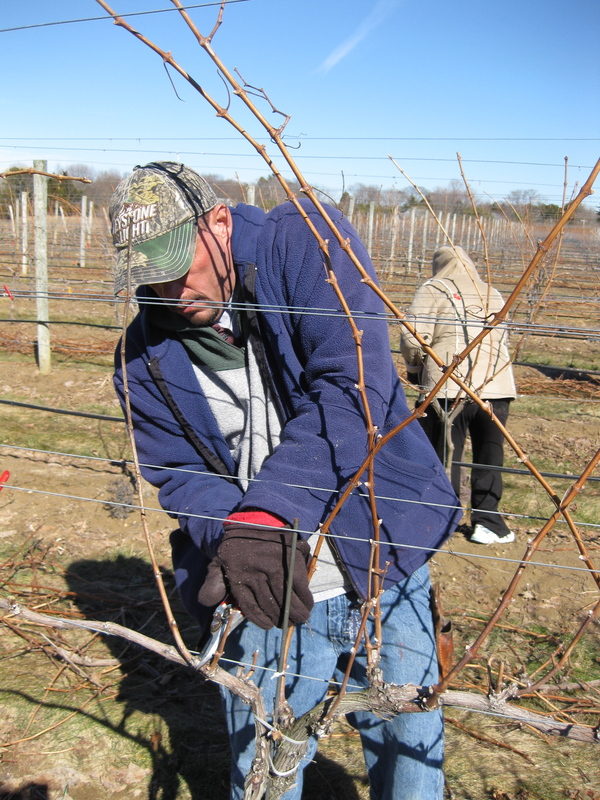 I have to admit that I am even more excited about the vineyard work underway than the warm sunny weather that we’re supposed to have for the next several days. Grapes on vines can’t be far behind!